On Wednesday September 30, 2015, the legendary Nasir Jones, or Nas, will be honored at the W.E.B. 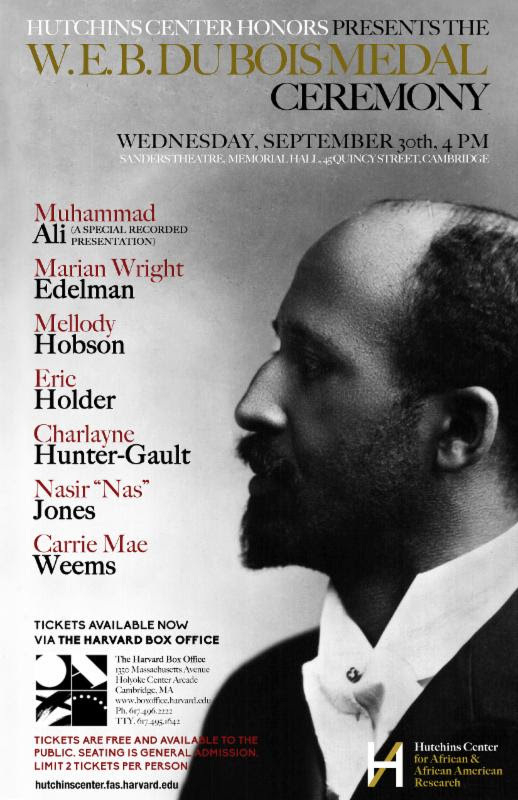 DuBois Medal Ceremony hosted by the Hutchins Center for African & African American Research at Harvard University. The W.E.B. Du Bois Medal is “Harvard’s highest honor in the field of African and African American Studies.” Since 2000, it has been awarded to “individuals in the United States and across the globe in recognition of contributions to African American culture and the life of the mind. Recipients have included scholars, artists, writers, journalists, philanthropists, and administrators whose work has bolstered the field of African and African American Studies.” Past recipients have included Maya Angelou, Shonda Rhimes, John Lewis, Sonia Sotomayor, Cornel West, Oprah Winfrey, Quincy Jones, Toni Morrison, and many more. Nas is a pioneer who has helped usher in an original form of Hiphop debate and analysis that reflects on and represents urban youth angst and conflict as well as intelligence, confidence, and ambition. In 1994 at age 19, Nas’s first full-length album, Illmatic, was released to near-universal critical acclaim. 1996 brought his breakthrough double-platinum It Was Written (#1 R&B for 7 weeks, #1 pop for 4 weeks). The streak continued with the double-platinum I Am in 1999 (again #1 pop and #1 R&B). Subsequent albums by Nas included: the platinum Nastradamus (1999, #2 R&B, #7 pop); the platinum Stillmatic (2001, #1 R&B, #5 pop); the platinum God’s Son (2002, #1 R&B); and the platinum double-CD Street’s Disciple (2004, #2 R&B, #5 pop). Nas’s most recent album, Life Is Good (2012), was his third consecutive Def Jam album to debut at #1 on the Billboard 200 albums chart. It followed the releases of the platinum, Grammy-nominated Hip-Hop Is Dead (2006), and the gold, Grammy-nominated untitled album (2008). His lyrics expose his own deep vulnerabilities while staying relevant to a wide audience and addressing both political issues and street topics. In addition to his successful career in music, Nas has pursued a career in motion pictures that began with his co-starring role alongside DMX in 1998’s crime drama Belly, a film by director Hype Williams with whom Nas has collaborated on several music videos. Subsequent screen appearances include Albert Pyun’s action crime thriller Ticker (2001); Carl Seaton’s Sacred Is the Flesh (2001, also co-written by Nas); a cameo as himself in Boaz Yakin’s comedy Uptown Girls (2003); Lawrence Page’s Murda Muzik (2004); the fictional hiphop group biopic The Vapors (2008); and the CBS television series, Hawaii Five-O. In 2014, Nas combined a musical tour with the release of his documentary film, Nas: Time Is Illmatic, marking the twentieth anniversary of his groundbreaking debut album. It was followed a year later by the release of his film Fresh Dressed, tracing the history and evolution of hiphop fashion. In September 2013, Nas visited the Hutchins Center to celebrate the announcement of the anonymously funded Nasir Jones Hiphop Fellowships through the Hiphop Archive & Research Institute Archive and W. E. B. Du Bois Research Institute. “Having welcomed artists including 9th Wonder and scholars including Mark Anthony Neal, the Hiphop Archive and Research Institute is uncompromising in our commitment to build and support intellectually challenging and innovative scholarship that reflects the rigor and achievement of Hiphop performance,” said Marcyliena Morgan, Professor of African and African American Studies at Harvard University and founder and director of the Hiphop Archive and Research Institute. The Nas Fellowship supports scholars and artists demonstrating exceptionally productive scholarship and creative abilities in the arts, in connection with Hiphop. Fellows are challenged to further develop work and art, to paraphrase Nas, that “speaks through American youth rather than speak about and to them” as simply passive subjects of study. Personal projects may include manuscript projects, performance pieces, album work, curriculum planning, primary archival research, and exhibition preparation, among others. The 2014-2015 inaugural Nas Fellows were Murray Forman and Damon Burchell-Sajnani. Nas Fellows for 2015-2016 include Christopher Massenburg, Regina Bradley, and Bettina Love.